I have a question for you: What is the state bird of Georgia? Times up! If you guessed the brown thrasher, you are right. On March 20, 1970, after a 35-year campaign waged by The Garden Club of Georgia Inc., the Georgia General Assembly designated the brown thrasher as Georgia’s official state bird. Since that time, many have questioned why the brown thrasher was picked as our state bird when there are so many far more colorful birds such as the northern cardinal, scarlet tanager and eastern bluebird to choose from. 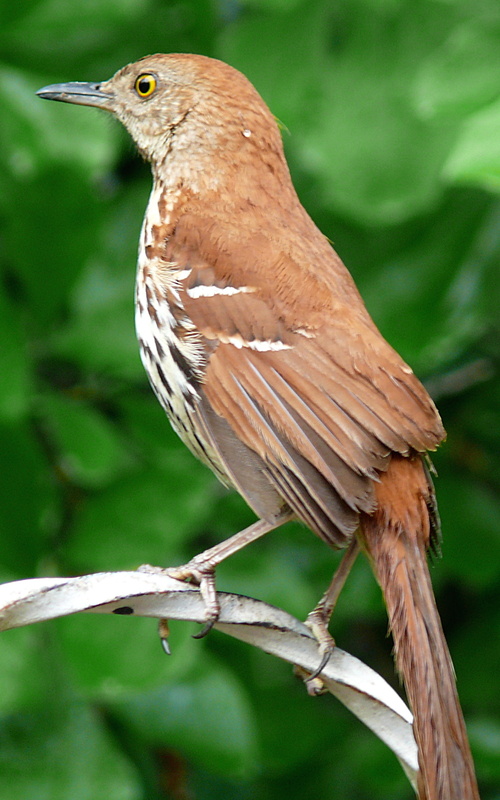 In truth, the brown thrasher was originally selected by school children in 1928. And I, for one, agree with the student’s choice. After I tell you a little about the bird, I think you will, too. In fact, I am convinced that you will want to invite it to reside in your backyard. Nobody is sure how the bird got its name. Some suggest that it was named for its color and habit of twitching its tail back and forth. This is reminiscent of a flail used years ago to thrash seeds out of the stalks of harvested grain. Others believe the name stems from the birds habit of thrashing leaves and soil in search of food. I would think that our state bird should be found throughout the state and indeed the brown thrasher is. It ranges from Rising Fawn in northwest Georgia to St. Mary’s on the Georgia coast. The brown thrasher is fairly large, measuring roughly a foot in length. While it is not blessed with eye-popping color, it is still a handsome bird. Its back and tail are foxy brown, while its creamy white breast is festooned with prominent dark brown streaks. The wings are marked with two white wing bars. Its eyes are bright yellow and its beak is slightly curved. The thing that distinguishes the brown thrasher from most other birds is its song. Oh, what a song! The brown thrasher is the master of one of the most extensive song repertoires of any bird in North America. More than 1,100 song types have been attributed to this species. Its catalog of songs includes snatches of the songs of many of its bird neighbors. The thrasher’s song consists of a string of phrases that are usually uttered twice. The famous writer and naturalist Henry David Thoreau described the brown thrasher call as, Drop it, drop it, Cover it up, cover it up, Pull it up, pull it up. Although its songs are similar to those of the northern mockingbird, it is fairly easy to tell the songs of the two apart as the mockingbird typically repeats the phrases in its vocalizations three times. Brown thrashers prefer to live in shrubby habitats like forests with a shrubby understory, in brushy fencerows and old fields, and in backyards accented with small trees and shrubs. Here the birds spends their day beneath shrubs scratching the ground with their powerful feet and tossing leaves and other ground litter aside with their formidable bills in search of small insects, worms, spiders and other tasty invertebrates. They will also dine on fruits, berries and nuts. If you want to attract brown thrashers to your yard, it is essential that you provide the often secretive birds with plenty of dense shrubs and fruit- and nut-bearing trees. They seem particularly fond of thorny shrubs that offer a barrier against the intrusion of would-be predators. There is any number of plants to choose from, including wax myrtle, native crab apples, dogwoods and hawthorns. Here is a tip: Leave fallen leaves beneath shrubs and in places near shrubby habitats. Brown thrashers love to hunt for food in such sites. Brown thrashers also frequent brush piles. If you don’t have one, create one in a back corner of your backyard. Thrashers and other birds will use the brush pile to escape predators and severe weather. Another feature that will help attract brown thrashers is a birdbath or small pond. While they will use birdbaths placed on pedestals, a birdbath located on the ground might be your best bet. You will find more different kinds of wildlife use it more than one perched in the air. Whatever type you use, make sure it has a sloping, rough bottom that isn’t over 1Â½ inches deep in its deepest end. At one time, brown thrashers were rare visitors to bird feeders. However, nowadays it is not unusual to see them at feeders. They are fond of suet, particularly if it is laced with peanut butter. If your pockets are deep enough, you might even consider feeding them meal worms. Believe me, a brown thrasher can go through a lot of mealworms in a short period of time. I hope you now agree with me that a handsome bird that also is an accomplished vocalist, pest control agent and inhabitant found throughout the state is a worthy neighbor and deserving of the title of Georgia’s official state bird. – Article by Terry Johnson, formerly with the Georgia Wildlife Resources Division, a noted backyard wildlife writer and expert, and executive director of TERN, the friends group for Wildlife Resources’ Nongame Conservation Section. It was published online at: http://www.georgiawildlife.org and submitted to the Thrasher Newsletter by John Paul Thrasher of Newnan, Georgia. Those who have visited Nancy Cherry’s home will remember the long country lane into their family farm is lined on one side with bushes, mainly blackberry bushes. The Brown Thrashers love that row of bushes. We think it is very appropriate.